Last season, the stars aligned for White Bear Lake when the Bears toppled then No. 1-ranked Hill-Murray in double overtime of the Section 4AA finals. A game for the ages, the outcome will not be forgotten. Especially by the Pioneers. Seeded first in the section again this winter, Hill-Murray (19-6-0) is set on revenge, looking for payback against No. 2-seeded White Bear Lake (14-10-1). The Pioneers are once again the favorite to take the 4AA crown, an accomplishment that would send them to the Xcel Energy Center for the fifth time in six years. Led by junior Jake Guentzel, (21-46-67) Hill-Murray is a talented and lightning-quick squad that isn’t afraid to punish other teams physically. Guentzel passes with ease, often setting up teammates Zach LaValle (25-31-56) and senior Charlie Sampair (27-16-43), a Mr. Hockey finalist, for goals. The three produce as well as any other trio in Minnesota, and will be difficult to contain. On the physical side, junior defenseman Blake Heinrich is one of the hardest hitters in state. He takes players off the puck with bruising but clean checks that make crowds cheer and remind opposing players to keep their heads up and pass quickly. Meanwhile, White Bear Lake has an interesting matchup in the quarterfinals against No. 7 St. Paul Johnson (13-11-1). The Governors feature senior Jay Dickman, a big man with serious skills as a forward. Listed at 6-foot-5 and 228 pounds, he is an intimidating force who has racked up 61 points this season (42 goals, 19 assists). Bears’ senior Mitch Morrisette (20-27-47) and freshman Jake Wahlin (14-30-44) headline the Suburban East Conference champions. State tournament veteran goaltender Jared Schletty has had a nice season, going 10-7-1 and allowing 2.55 goals against per game. White Bear Lake had a strong finish to the season, winning convincingly over section foes Mounds View, and Stillwater. No. 3-seeded Roseville (15-8-2) faces off against No. 6 North St. Paul (15-10-0) in a quarterfinals duel that should provide a tough challenge to White Bear Lake -- should it beat St. Paul Johnson. Roseville relies on stellar goaltending from junior Zach Larson (7-6-2), who has a 2.07 goals against average, and saves 92 percent of shots. Both numbers are tops in the section. 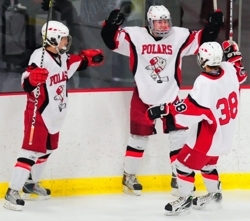 North St. Paul (15-10-0) has nearly twice the scoring numbers of the Raiders. Polars’ senior George Splichal (32-25-57) and sophomores Tyler Oliver (16-40-56) and Justin Oliver (22-30-52) have combined for more points than the entire Roseville team. The game should be a classic goaltending versus goal scoring matchup. Mounds View (14-10-1) and Stillwater (12-11-2) finished neck-and-neck in the Suburban East Conference. Stillwater edged the Mustangs for third place, but Mounds View won both meetings between the teams during the regular season, earning the Mustangs the fourth seed. Darian Romanko (21-18-39) and Morgan Puncochar (12-23-35) are the top scorers for Mounds View while Nick Anderson (7-16-23) holds the lead for Stillwater. No. 8 Tartan (9-15-1) and No. 9 St. Paul Como Park (6-16-0) will battle for the right to take on Hill-Murray in the first round of the playoffs. Tartan, led by Jake Jackson (24-19-43) and Eric Olheiser (8-23-31) know how to score. The Cougars’ Josh Powers (15-12-27) and Sawyer Scanlon (17-8-25) look to take down the Titans. Barring another magical performance from White Bear Lake, Hill-Murray looks set to make it through Section 4AA. The Pioneers are fresh off a big win over now No. 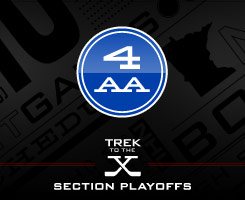 10-ranked Moorhead, and are simply too talented not to take a trip to the X this season. The Polars can score and then score and then score some more. With their offensive potential, they could wreak havoc in the quarterfinals and semifinals leaning on George Splichal and the Oliver twins. If its big three show up, look for North St. Paul to make it to the Section 4AA finals.